Usually you can as well make do with some more duct tape. Zip-ties are not afraid of water. Yet, they cannot provide any isolation from it, while duct tape can hold it for a little while. Zip-ties are susceptible to frost. I witnessed how some of them cracked at -20 °C. Still, many plastic things become fragile when it’s below zero. With a bit of practice, they can be disassembled and reused. Duct tape rarely can be reused after it has been torn away. Duct tape leaves nasty glue residue when removed. Zip-ties do not, but they still can leave a mark on soft materials they held together, like foam or plastic. I read somewhere that white zip-ties slowly degrade under Sun’s radiation and therefore should not be used outdoors. I am yet to verify this claim through experimentation. Next question: what comes third after duct tape and zip-ties? Sugru? Wire of metal? Good old thread and needle? If that is not enough evidence for you, check out this video and count how many applications zip-ties find in it. 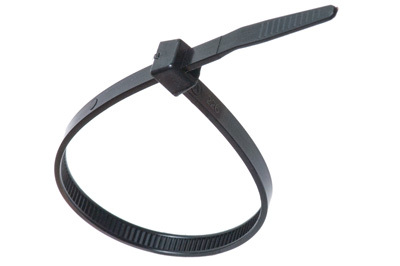 And, if you still do not know how to use a zip-tie, here is an instruction video.